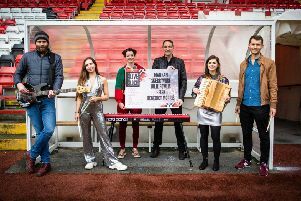 A local band is looking forward to a record-breaking charity gig at the Barras next month. Their performance, in aid of the Clutha Trust, will make Colonel Mustard & the Dijon 5 the first unsigned band to headline at the Barras twice. They also won Best Live Act at last year’s Scottish Alternative Music Awards. The band’s manager, David “Dijancer” Blair, said: “We found that out thanks to our friend Nuala Naughton who has written a book on the Barras. She’s collected all manner of information about the venue from its first ever gig with Simple Minds in 1983 up to the present. David describes the Dijons as the “ultimate party band” and they are also founders of the Yellow Movement, a growing subculture in the Glasgow music scene which advocates a Do-It-Yourself attitude as well as bringing people together and making them happy, according to its manifesto. Unsurprisingly, the colour yellow also features prominently in the attire of performers and audience alike. Ally McNeilly, a young singer/songwriter from Cumbernauld, has been confirmed as performing and the lineup also includes The Girobabies, Jamie & Shoony, Have Mercy Las Vegas, The Twistettes. For more see www.dijon5.com.